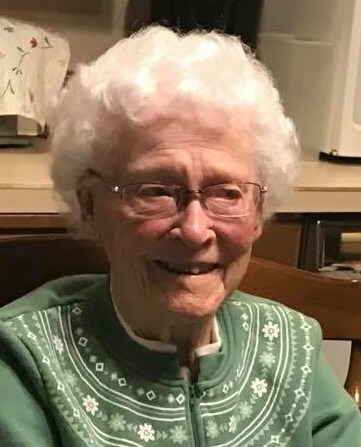 Age 94, of N. Main Street, Fort Loramie, passed away of natural causes Saturday afternoon, April 13, 2019, at the Landings of Sidney in Sidney, Ohio. She was born December 12, 1924, in Fort Loramie, Ohio, to the late Aloysius and Louise (Inderrieden) Ernst. On April 8, 1944, in Phoebus, VA, Sis married Leo F. Goubeaux who preceded her in death on February 10, 2011. Surviving are six children: De Dee & Ken Meyer of The Villages, FL, Chuck Goubeaux of Fort Loramie, Kevin & Deb Goubeaux of Fort Loramie, Brenda & Mike Harris of Alpharetta, GA, Doug & Amy Goubeaux of Fort Loramie and Joyce & Larry Tebbe of Covington; fourteen grandchildren: Jannelle Riguez, Greg & Keri Meyer, Jason & Kelly Meyer, Brian & Jill Goubeaux, Christopher & Jennifer Goubeaux, Renee & Jason Grieshop, Scott & Tracy Goubeaux, Jesse Harris, Rachael Harris, Hana Goubeaux, Abby Goubeaux, Jordan & Peggy Tebbe, Chelsea & Jeremy Gilliam and Tyler Tebbe along with 23 great-grandchildren. Also surviving are two sisters-in-law, Anna Mae Ernst of Sidney and Ruth Larger of Kettering. She was preceded in death by two siblings, Thomas Ernst and Katie Brechbill as well as seven brothers & sisters in-law. Sis was a 1942 graduate of Fort Loramie High School. She retired in 1988 from G & W Tool & Die where she had been employed 20 years. She was a member of St. Michael Catholic Church. An avid sports fan, Sis followed Reds baseball, UD basketball and Ohio State everything. She also enjoyed Tuesday night ladies bowling league at Community Lanes as well as various card clubs. Mass of Christian Burial will be 10:30 AM, Wednesday, April 17, 2019, at St. Michael Church in Fort Loramie with Steven Shoup presiding. Interment will follow at St. Michael Cemetery. Friends may call Tuesday 4:00 to 8:00 PM and Wednesday 9:00 to 10:00 AM at Gehret Funeral Home in Fort Loramie. Memorials may be made to Wilson Health Hospice or charities of donor's choice. Private condolences may be expressed at www.gehretfuneralhome.com.